This is story time out here at the Solitary Writers space. So all you bloggers keep reading. This is a story of two cats who were two best friends.But sometimes they would fight over some petty issues. They spend their whole day tramping for food. They would steal food from houses and garbage boxes.It was a sunny day and their misadventures continued everyday as usual. This time they stole a chocolate cake from a birthday party. "so what ,I stole this cake you see," Cat 1 said. "This is so annoying and I absolutely hate you for this...This is unfair man," Cat 2 got vexed for once. They both fought and there was a clever wicked monkey who was keenly observing all this. He ran to the rescue and planned to take his share. "Hey my Sweeties, why are you guys fightin?," The Monkey said to the cats. 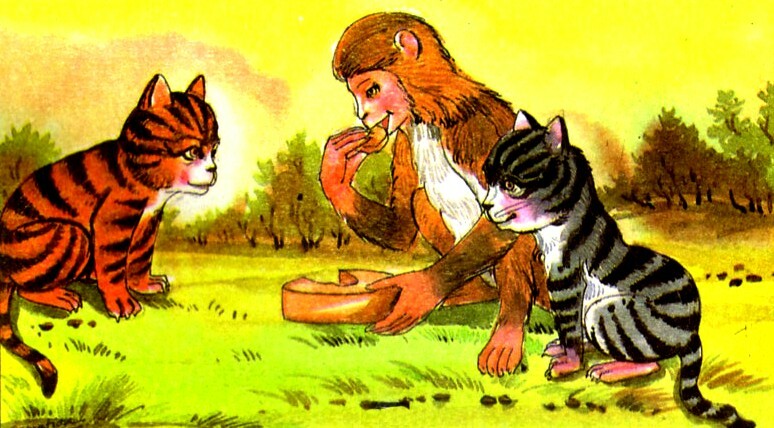 "We both stole the cake and I'm not getting my share of the cake.This is unfair.. no," Cat2 said to the Monkey. "No issues, I guess I'm here to give justice and trust me you two I will make a fair decision,"The Monkey winked. Soon a wicked idea struck the monkey's mind and the monkey divided the Cake into two halves.One half was probably smaller and the other half was bigger. "Oh no! this is bad . One half is big.Let me eat some part to make it equal," the monkey said to which the two cats nodded their heads. The two cats were bewildered and had to listen to the monkey's words. Once again the monkey did the same trick and like this he happened to eat the complete cake. The poor cats were disappointed and helpless at their own plight. Moral- This is an amazing story and it gives an important moral to learn.We should keep our fights within ourself.No matter whatever be the scenario we should not let an intruder inside our life to take our share of happiness. I hope this story makes sense although its quite a popular one in India. Promises are like babies.It's fun to make it but its a hell while delivering. Did you like this post? Get The Solitary Writers updates via Facebook or Twitter, better yet, subscribe to it via RSS Feed. It’s easy, and free! Comments are just another way to let me know how you feel.Don't forget to comment. A very timely tale that proves a point...if taken in the right context. Bravo for penning it. How true. The two cats could have settled this amicably but with the monkey on the scene there were always going to be two losers. The cats were selfish and could have solved it themselves. They allowed their selfishness to cloud their judgment and forfeit their wisdom. Unfortunately we all do that at one time or another.